Place all ingredients in large bowl; be sure to mix well. Place the pork belly in a container that will hold it comfortably; completely cover the pork belly in the cure. Place in refrigerator and allow to cure for 48 hours. After 48 hours, rinse the cure off and pat dry. For braising the pork belly, set oven to 325°F. Bring 1 quart of chicken stock to a simmer. Place pork belly in braising pan; pour the chicken stock over until it covers the pork belly by about 90%. Cover and place in a 325°F oven for approximately 2 1/2 hours or until you can easily insert a thin knife into the belly that does not pull up when taken out. Carefully remove the belly from the braising liquid and place in the refrigerator to cool; save some of the braise for the black-eyed peas. After the belly is completely cool, cut into 2 inch by 2 inch squares and set aside. Sweat vegetables in oil and then add garlic; continue to sweat until garlic is soft. Add the soaked black-eyed peas, chicken stock and pork jus. Stir in remaining ingredients. Cook until peas are just soft. Cool down in the cooking liquid. Dry off the scallops and season with a pinch of kosher salt. Place a pan over medium high heat; drizzle a couple tablespoons of oil in the pan. When the oil is shimmering, gently place the scallops in pan; make sure to not overcrowd the pan to ensure even cooking and to achieve a nice golden brown sear. Sauté for about 2 minutes; turn and cook for one more minute and then remove from the pan. Meanwhile heat another pan to medium heat, add 2 tablespoons of oil and brown the pork belly on all sides. Place the black-eyed peas and Swiss chard in a small pan and reduce the liquid by 90%. Stir in 2 tablespoons of butter and squeeze the juice of half a lemon. Finish the black-eyed peas with a pinch of fresh chopped parsley. Spoon the black-eyed peas and chard onto each plate. 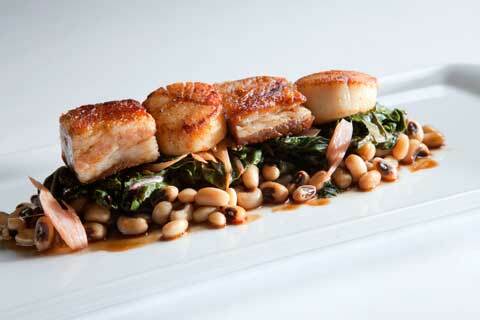 Arrange the 3 pieces pork belly and 3 scallops on top of the peas; spoon any remaining liquid around the plate.